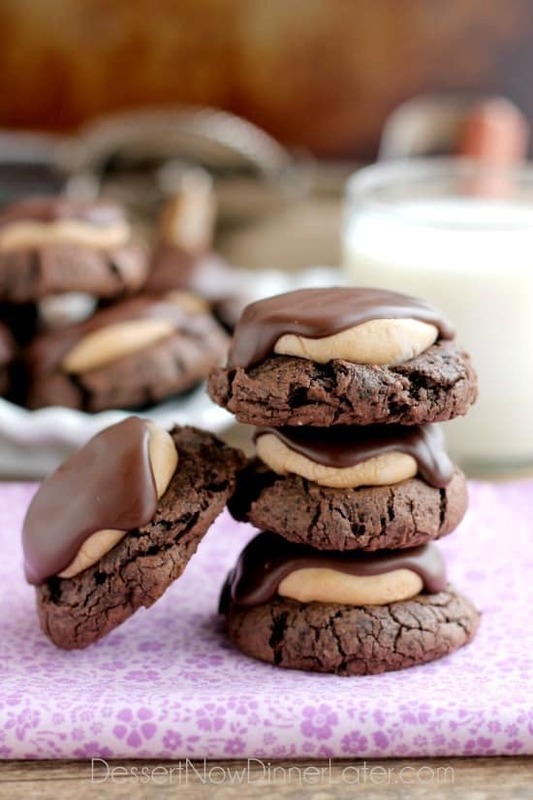 Buckeye Cookies - Dessert Now, Dinner Later! These are so easy to make, my son even helped me. 7 ingredients and you get 24 of these bad boys! The only part that is a little messy/time consuming is rolling the peanut butter balls, but it’s worth the effort, I promise! 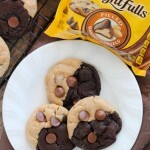 You HAVE TO, have to, HAVE TO make these! In a stand mixer using the paddle attachment, beat the brownie mix, butter, cream cheese, and egg. The dough will be thick, and slightly sticky. 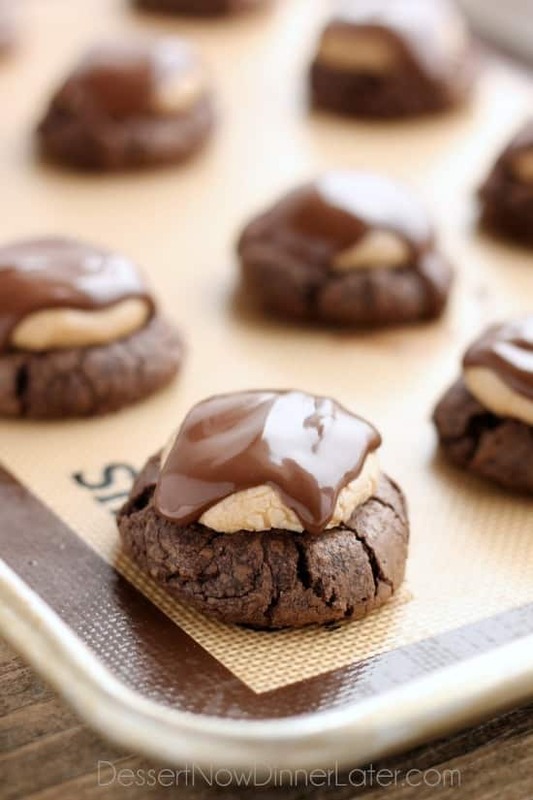 Scoop the dough onto two silicone lined baking sheets, making 24 cookies. Smooth the edges of each dough ball to form a round cookie. A dab of water or cooking spray on your fingers helps! In a separate bowl, mix the powdered sugar and the peanut butter until it is completely combined. Form the mixture into twenty four, 1-inch balls. You may need a little extra powdered sugar to roll the balls, but don't dry them out. Set aside. Bake the cookie dough at 350 degrees Fahrenheit for 12 minutes, keeping an eye out to make sure the cookies don't over-bake or under-bake. 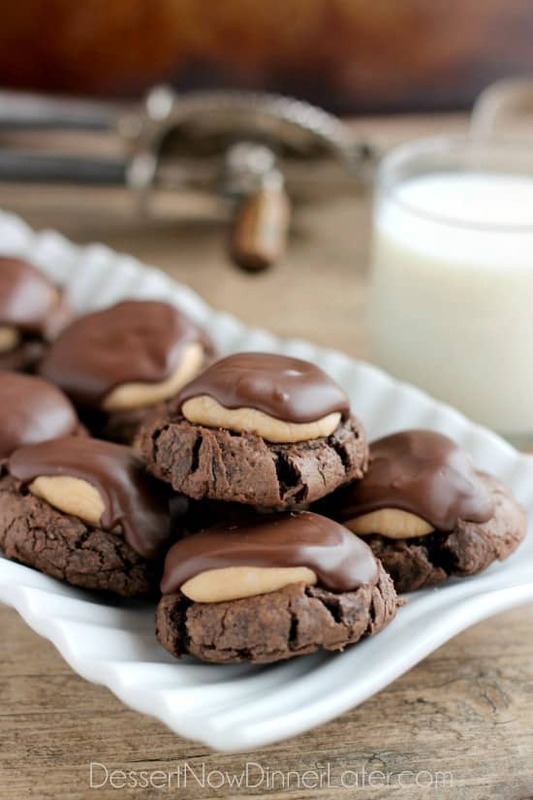 As soon as the cookies come out of the oven, press a peanut butter ball lightly into the center of each cookie. The peanut butter mixture will soften slightly, but that's okay. Let the cookies cool for 5 minutes. You can transfer them to a wire rack to cool completely or keep them on the cookie sheet. 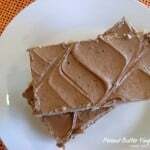 Melt the 4 blocks of chocolate Candiquik in a bowl in the microwave for 45 seconds. Stir the chocolate and melt for additional 15 seconds or until the chocolate is completely melted. 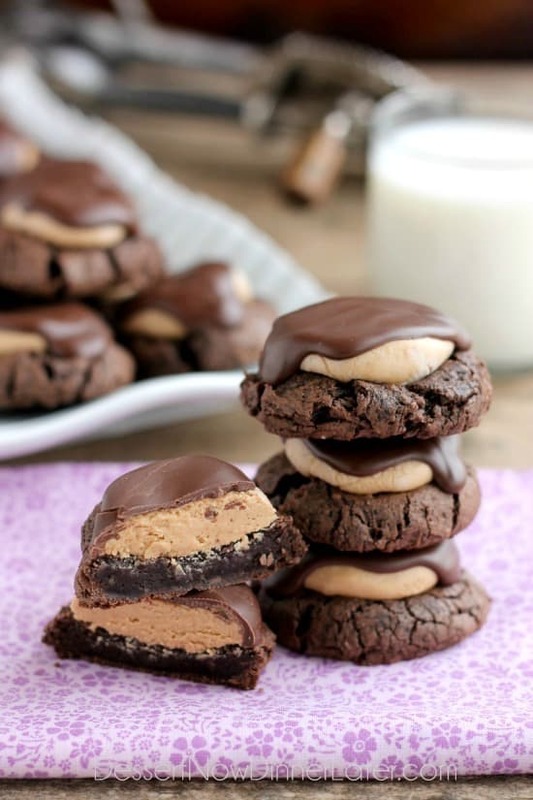 Spoon about ½ Tbsp of melted chocolate on top of each cookie so it covers the peanut butter ball. Let the chocolate set. Store in an airtight container. Recipe from Tastes of Lizzy T and re-written in my own words. Oh my! Those look so good, and plenty easy. What a great idea! Thanks Carlee! They are pretty dang fantastic! YES! Heaven on earth for sure. 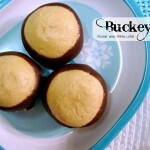 I love buckeyes! These are ridiculously delicious! Like ridiculous! Haha. Oh my word!! 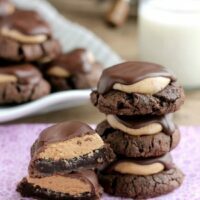 I love that you made buckeye cookies, they look incredible! 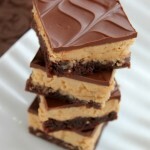 Chocolate and peanut butter is always a winner around here! I had a REALLY hard time not eating them all. They’re an awesome PB/Chocolate combo! Just wanted to let you know, I love your blog! You have lots of amazing recipes that I have pinned for later. Hopefully by pinning lots of your recipes, I can help by getting your blog out there! Thanks for your sweet comment Alicia! I really appreciate the feedback, and that you are pinning my things! THANK YOU SO MUCH!!! You can try, I haven’t frozen them myself though. Will I find the Chocolate Candyquik in theory Store ??? What else could I use ??? You can find CandyQuik in the baking aisle at Walmart. You can also try almond bark, or some melted chocolate chips with a little shortening or coconut oil to thin it out. (Like 1/2 cup chocolate chips and 1/4 tsp shortening or coconut oil.) I hope this helps! Oh…Thanks …have Coconut oil and chips !!!! !